A special issue celebrates the thousands of educators who are working to teach people about the West. But it also raises some questions: Who are they reaching and where should the lessons be learned? 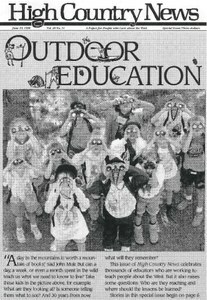 A state-by-state directory describes some of the many outdoor education programs in the West. A program called Volunteer-led Investigations of Neighborhood Ecology (VINE) introduces urban children to nature, as demonstrated by Denver's Garden Place Academy. River guide, author and activist Roderick Nash describes a method of outdoor education he calls "unguiding" - letting the river teach its own lessons. The Student Conservation Association has been sending thousands of young volunteers to help maintain national parks since 1957. The writer describes a tough and educational time spent working in the inner city with the San Francisco League of Urban Gardeners. A former professional outdoor educator traces his slow disillusionment with wilderness programs that live off the urban high-tech society and teach nothing about truly living simply on the land. Writer and Wyoming native C.L. Rawlins considers the good and bad inherent in trying to provide an outdoor education. Writer and naturalist Terry Tempest Williams lauds the lessons she learned from the Teton Science School. Strange bedfellows in the West: Wal-Mart and Main Street, sheep and range restoration, javelinas in Washington state, cartoonist John Callahan runs for Oregon state Legislature, Cheetos in space, cowboys and California. Special issue, board meeting in Grand Junction, drop-ins, odds and ends. The Colorado Air National Guard's plan to increase fighter-jet training over southeastern Colorado raises opposition from environmentalists, ranchers and residents - and from Colorado Springs' booming airport. The Colorado Air National Guard's plan to increase training flights over the Sangre de Cristo and Wet Mountains and the San Luis Valley upsets locals, including contemplative monks in Crestone. A GOP memo to this year's Republican candidates urges them to start looking green. Two Chelan County commissioners defy Washington state's Growth Management Act, claiming freedom from state and federal controls. Former U.S. Senator Dan Evans, who once supported Washington state's Growth Management Act, now seeks to change the law after finding it will prevent him from building a house where he wants. An irrigation district's water diversion from the Rio Grande in New Mexico wipes out an estimated 70 percent of the endangered silvery minnow population. The Colorado Legislature passes a bill allowing the state Corrections Department to ignore local zoning when it wants to build or expand prisons. Under the salvage logging rider, thousands of acres of habitat of the endangered marbled murrelet may be cut in coastal Washington and Oregon. To improve trampled vegetation and watershed in California's Ishi Wilderness, Forest Service officials remove 13 tranquilized bulls by helicopter. Republican Gov. Tony Knowles of Alaska joins an environmental lawsuit fighting Columbia and Snake River dams in the Northwest to save endangered salmon.